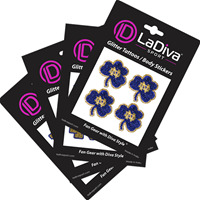 LaDiva Sport® makes Fan Gear with Diva Style™! For 7 years, we have been creating fan-favorite glitter body stickers and face tattoos, as well as hats and jewelry. For 2019, we are excited to launch our new Pop-Up Fan Fan™! Visit us at Booth 3145 to find out more! Licensed to Buy Participant! To use, simply peel the sticker from the backer card and apply to skin. When finished, remove sticker and apply to any hard surface to continue to show your school spirit!